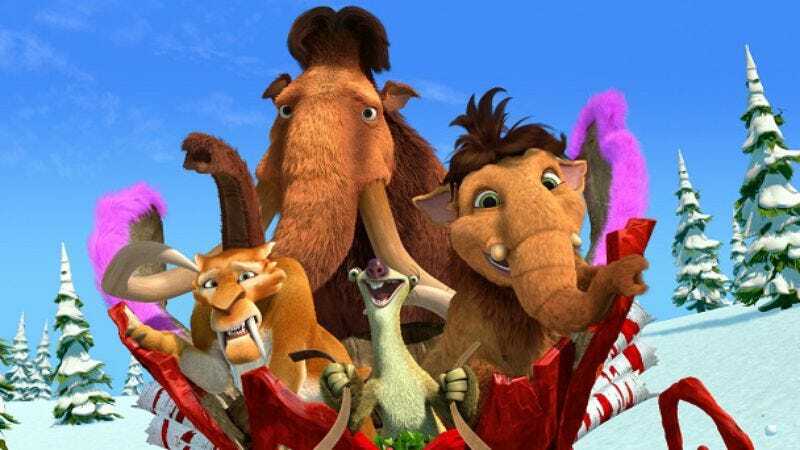 Ice Age: A Mammoth Christmas debuts tonight on Fox at 8 p.m. Eastern. Blue Sky Studios—responsible for the Ice Age films and Rio, among others—is an incredibly frustrating outfit. It has the potential to make an animated film that’s not just highly entertaining but is also unlike any other computer animated film yet made, yet it keeps racing away from its own best material to try and be Pixar lite. Obviously, wanting to be like Pixar isn’t a bad thing, and it’s what keeps Blue Sky’s product generally watchable, as opposed to the hit-and-miss chaos that is the output of Dreamworks Animation. But at the same time, the sentiment in Blue Sky’s films—the very first Ice Age largely excepted—feels forced in a way it rarely does in Pixar’s output. The company’s films come alive when they engage in Looney Tunes-style chaos, a tone that no other computer animation studio does quite so well, and it’s always disappointing to watch, say, a scene where Scrat gets caught up in something out of a Daffy Duck cartoon, then be deposited back into a bunch of learning and growing and family togetherness. Thus it’s kind of terrifying to see Blue Sky take on a Christmas special. Christmas specials, of course, are all about learning and growing and family togetherness. You can bet that if someone is even the slightest bit skeptical about the magic of Christmas—as someone is here—they’ll be convinced of the specialness of the night by the end. And you can bet that any wacky slapstick—like the usual amusing antics of Scrat trying to get that acorn—will be shoved aside by a story that seems to be mostly going through the motions. At the same time, Blue Sky has created a batch of characters who are fun to hang out with, so watching this half-hour special isn’t painful or anything. But there’s nothing here that’s even as distinctive as, say, Shrek The Halls, to say nothing of ABC’s Prep & Landing, the gold standard of recent Christmas specials. The plot here is fairly simple. For whatever reason, the characters of the Ice Age franchise celebrate Christmas, but their traditions are far from the ones we know and recognize. Manny the Mammoth (Ray Romano, as always) enjoys hauling out the family Christmas rock every year, for instance, and he scoffs when Sid the Sloth (John Leguizamo) proposes decorating a tree instead. When Sid causes a decorations disaster that angers Manny, however, Manny makes up the idea of a “naughty list,” something that ensures that Santa—who’s someone everybody is pretty sure exists, though no one’s seen him—will pass you by and make sure that Christmas doesn’t come for you this year. (The story of how Christmas works for these characters is full of logical inconsistencies that are best not to think about too hard, not least of which is how they celebrate the holiday in the first place.) Horrified by the idea of being on the naughty list, Sid sets out with Peaches (Ciara Bravo), Manny’s daughter, and his other friends for the North Pole, in order to convince Santa to remove him from the list. The actors give this their all, for the most part. Even Denis Leary, as Diego the Sabretooth Tiger (a character that’s largely been relegated to the sidelines as the franchise has gone on for no particular reason), seems to be trying to throw himself into the spirit, though Leary’s gravelly voice doesn’t necessarily suggest Christmas cheer immediately. (One of the best moments is listening to Leary express delight as Diego chases after a ball of twine, and many of the best non-Scrat gags involve Leary doing something goofy off on the sidelines.) Romano and Leguizamo are fun, and though Queen Latifah remains stuck in the role of Manny’s wife, she’s giving it her all as well. Even Billy Gardell as—spoiler alert!—Santa offers a new twist on what’s a pretty thankless role in a Christmas special. There’s something to be said for all of these actors reprising their film roles, and the acting is spirited, even if the plotting isn’t. There’s also the core of an interesting special here, about the characters inventing the Christmas traditions we observe today, almost by accident. It’d be amusing to have your kids think that basically every vaguely Christmas thing out there—right down to mistletoe and the song “Deck The Halls”—was invented by mammoths. Indeed, the special stops just short of having one of the characters give birth to the Christ child, in terms of mixing everybody in with the usual stories of the holiday. It’s kind of fun to imagine Santa Claus as a big fat guy who lived at the North Pole and really liked Christmas before he got initiative to do more, and while an origin story for Santa isn’t the newest idea for a Christmas story, there’s something appealing to the way this one unfolds almost accidentally. But at the same time, everything proceeds so predictably that it’s hard to recommend the special. There are fun things going on in this special, but in the truest Blue Sky tradition, the whole special gets buried under forced heart and becomes mawkish in the end. Once again, there’s a story grafted on about how it’s better to be in a community than be out on your own (the theme of every Ice Age project), and there’s nothing here that hasn’t been done better in a million Christmas specials before. The best Christmas specials really risk something by trying to tell a story that goes to some genuinely dark or scary places before letting in some light at the end. But there would be room for a raucous, wild Christmas cartoon, sort of a Bad Santa equivalent for tykes. Every time A Mammoth Christmas starts to head in that direction, it’s forcibly yanked back on course by a script that doesn’t offer room for anything more than paint-by-numbers Yuletide spirit. I couldn't work this in organically, but I've been thinking about it since watching this. All three of the big computer animation studios have a central trilogy that works as that company's definitive franchise, for better or worse. Obviously, Pixar's Toy Story films are the gold standard of this sort of thing, but are the Ice Age films in second place by default? Shrek is probably better than the first Ice Age, but I'd say the two Ice Age sequels, which aren't great but are a touch underrated, are better than the Shrek sequels. As always in an Ice Age project, the Scrat stuff is very funny. It's almost worth tuning in to the first few minutes of the special, though there's disappointingly little of it. There are a lot of names in the voice cast, including Judah Friedlander as a "mini-Sloth," T.J. Miller as a reindeer, and Seann William Scott, who returns as one of Sid's friends.